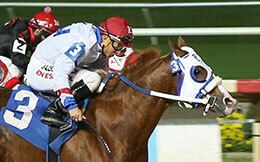 All American Futurity(G1) winner Apocalyptical Jess, the top-ranked 2-year-old on the AQHA Racing National Poll, drew post 6 for Saturday’s 400-yard, $1,014,657 Texas Classic Futurity (G1) at Lone Star Park. GRAND PRAIRIE, TX—NOVEMBER 8, 2018—Apocalyptical Jess, a son of world champion Apollitical Jess and the top-ranked 2-year-old on the AQHA Racing National Poll, drew post 6 for Saturday’s 400-yard, $1,014,657 Texas Classic Futurity (G1) at Lone Star Park. Trained by Blane Wood for owner Bill T. Robbins, Apocalyptical Jess has earned $1,509,700 from five starts, and his three wins include a three-quarter length victory in the 440-yard, $3-million All American Futurity (G1) at Ruidoso Downs on September 3. The 9-5 morning-line second choice, the gelding will be ridden by Raul Ramirez Jr.
Wood will also send out Flying Cowboy 123, a sorrel colt by Apollitical Jess and the fastest qualifier, for owner Paragon Farms LLC. Flying Cowboy 123 is coming off of a 1 1/2-length victory in the seventh of 14 trials on October 20. The colt has won three of five starts and has banked $192,900, and his record includes a second-place finish in the 400-yard, $1-million Rainbow Futurity (G1) at Ruidoso Downs in July. Flying Cowboy 123 drew post 4 and will be ridden by Ricky Ramirez. Other contenders include Long Wagon Ho, an undefeated son of Pyc Paint Your Wagon owned and trained by Julio Corral. Long Wagon Ho has won all three of his starts, including the 300-yard, $371,000 Oklahoma Futurity (G3) at Remington Park in March. Long Wagon Ho drew post 5 and will be ridden by Alfredo Triana Jr.
Also on Saturday, a full field of 10 2-year-olds has been entered in the 400-yard, $53,403 Texas Classic Juvenile Stakes. Blue Star Racing’s Dak, a gray son of Dominyun trained by Leon Bard and the winner of the 350-yard, $479,000 TQHA Sale Futurity (RG3) at Retama Park in July, has earned $216,244 from four races. The gelding drew post 10 and will be ridden by Francisco Calderon.